October during the Autumn season is one of the best month’s to come down to the shore and enjoy the fall. Our weather in Cape May is crisp and sunny and the average temperature during the day range from the high 60 degree sunny days and cool 50 degree evenings. Cape May offers a number of events including Whale Watching, World Class Birding, Shopping, and fishing during the Autumn season. October also brings the Lima Bean Festival in West Cape May October 12, 2013 The West Cape May Annual Lima Bean Festival is the one event you must attend. Limas, limas, limas, soup, tacos, salad, jewelry, t-shirts and more!!!! Great food, quality vendors, antiques, entertainment and fun. Come out and celebrate West Cape May’s farming heritage. You will never think of legumes the same way again. Located in Wilbraham Park from 9:00AM to 5:00PM. Rain date October 13. Call Diane Flanegan at 609-884-9325 for information. Cape May Victorian Weekend takes place from October 11-15, 2013. This is the best time of year to visit Victorian Cape May and celebrate the unique heritage of America’s first seashore resort. Enjoy a weekend of exciting and entertaining activities from history to murder mysteries, plus house tours, food and wine events and much, much more. You can learn more about the Victorian Weekend by visiting the following Mid Atlantic Center for the Arts web site. Cape May Whale Watching during the Fall Season. October brings some of the best dolphin and whale watching sightseeing months of the year. The cool air combined with the warm water and natural migration patterns on the Jersey Shore promises for bright sunny days for a boat trip. You will always see schools of dolphin’s off-shore and the Cape May Whale Watcher offers a mammal sighting guarantee for you trip if you don’t make a sighting during your trip. The Cape May Whale Watchers offers three trips per day throughout the month of October. Visit the Cape May Resort ticketing site and save 10% on all of your fall Whale and Dolphin Watching during the fall season. Use promo code CAPEMAYRESORT and get Whale and Dolphin watching discount for all of your fall tickets. Cape May Shopping and Restaurants during October. Cape is a year round resort destination, and offers some of the best dining and shopping at the Jersey Shore. All restaurants are open during the busy fall weekends; you can anticipate some reduced openings during mid-week. Visit the Cape May Washington Mall site to check for openings of check here for a complete list of Cape May Restaurants. Score a Discount on Travel Deals and Accommodations in Cape May. October offers discounted rates on premier Cape May properties for your weekend stay. Check early for your reservations, as September and October will be very busy with the height of the Wedding Season during the autumn season. To check on local availability in Cape May for the October Season please visit the Cape May Resort Travel site here powered by Expedia. Go Fishing in Cape May during the Fall Season in October. Cape May offers some of the best fishing during the cooler months of the fall season. The annual Striped Bass run begins as the water begins to cool off shore and the baitfish begin to surface. The Famous Cape May Rips located across from the Cape May Lighthouse offer world class Striper fishing. The Cape May Lady offers 4 hour fishing trips three times per day, sailing from the South Jersey Marina in Cape May. 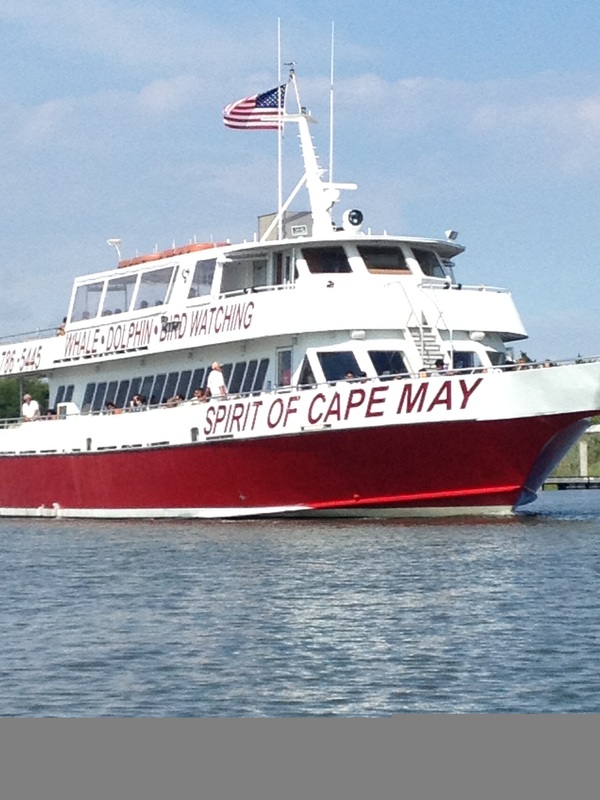 You can book tickets on line with Cape May Resort and save 10% for your fare. This entry was posted in Cape May Resort Blog and tagged Cape May October Events 2013, THings to do in CAPe May on September 22, 2013 by Ryan Reclaim. Save Money and Time with Cape May QR Coupon aboard Cape May Whale Watcher – The 110 foot Cape May Whale Watcher has been whale and dolphin watching in the Cape May, Wildwood, Stone Harbor, Atlantic City and the rest of the New Jersey Shore area since 1993. We have also been history cruising in conjunction with the Mid-Atlantic Center for the Arts since 1993. The Cape May Whale Watcher Guarantee – If marine mammals* are not sighted on your trip, you will receive a free pass for another trip. The pass does not expire ever and can be used on any of our regularly scheduled marine mammal cruises. The guarantee does not entitle the ticket holder to a refund. *Marine mammals include Dolphins, Whales or Porpoise on any trip! 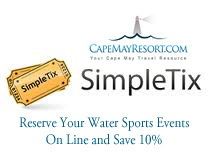 Order Your Tickets in Advance for your vacation or click on the Cape May Resort Simple Tix icon below to check upcoming schedules. You always get a 10% saving for Cape May Whale Watcher Tickets purchased on line. You should plan to board 30 minutes before your departure time and don’t forge to bring cameras, sun screen and a wind breaker for a windy day. Parking is free and strollers are welcome and advised for children under two years of age. Whale Watcher ships include a full snack bar serving hotdogs, snacks, and ice cream is available along with hot and cold beverages. Please view the Cape May Whale Watcher video below and enjoy the view of our local Cape May Dolphins. 6:30 PM 2 Hour Dolphin Watch and Sunset Cruise Complimentary Pizza and Hot Dogs Incl. 7:00 PM 3 Hour Fourth of July Fireworks Cruises Celebrate Independence Day with us! This entry was posted in Cape May Resort Blog and tagged Cape May Memorial Day THings to DO, Cape May Whale Watcher Events, Discount COupons CaPe May Whale Watcher, Get tickets for the Cape May Whale Watcher, Go Dolphin and Whale Watching in Cape May NJ, THings to do in CAPe May, What to do in Cape May NJ on May 21, 2013 by Ryan Reclaim.